Home » Tennis » The Tennis Elbow Brace, Does It Really Help? The Tennis Elbow Brace, Does It Really Help? Even though a tennis elbow brace is one of the simplest ways applied to treat tennis elbow, it actually provides comfort and relief for those who suffer from this condition. It is not only worn for relief and protection, but at the same time it provides a soothing effect to the injured part of the elbow and it also promotes healing since wearing an elbow brace can help in making the tired and inflamed muscles rest. Wearing an elbow brace is technically called the lateral counter-force bracing. Many therapists believe that this can actually reduce the magnitude of muscle contraction. This means that it reduces the amount of load that is placed on the tendons thus reducing trauma on the muscle attachment in the elbows. Somehow, they provide relief to the muscles; when the muscles do not feel any stress, they can get the enough rest that they need. The brace limits the movement of your injured arms allowing it to rest well. Another advantage that elbow brace can give when you have tennis elbow is that is provides warmth to your arms or the affected area, thus allowing proper blood circulation. When there is a good amount of blood circulation through your arms, enough oxygen and nutrients will be distributed to the tendons allowing it to heal quickly. 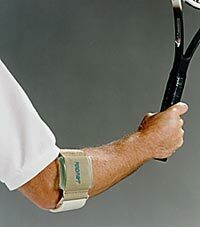 Also an advantage of tennis elbow brace is the support and protection that it offers your arms. With elbow brace structured to protect the affected area of tennis elbow, this is a sure way to avoid and prevent further injury. Thus, it will enable your arms to heal faster. Using an elbow brace, you may be able to progress with the healing process. When this happens, you will be able to return doing your normal activities quickly. It is recommended that you use an elbow brace that is designed properly and will suite your arms comfortably – it should not be too tight or too lose. With tennis elbow braces your arms will be able to recuperate in no time. Thanks for the info, Cecil! The preventive benefit that tennis elbow brace offers is recommended for sports players and manual workers who do repetitive motions using their arms. It prevents from using your arms to move in the wrong form because it corrects the proper posture and restricts movement allowing your arm to rest in its best position. Be sure to choose brands that gained reputation in tennis elbow braces and is flexible enough to fit in your arms.